WILLIAM JOSEPH SMITH was a MORMON SHOOTER and CLUBBER and a pvt. 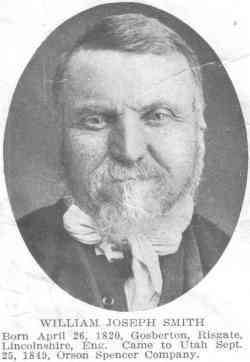 in the Iron County Militia; (son of William Smith, born at Ruthland, Lincolnshire, Eng, and Sarah Atkinson, born at Rippingale Eng ) Born April 26, 1820, Gosberton, Risgate, Lincolnshire Came to Utah Sept 23, 1849, Orson Spencer company. Married Mary Ann Frier 1845 (daughter of Samuel Frier and Roseline Walker), who was born May 18, 1821, Pinchback, Lincolnshire Their children William Smith b Feb 20, 1846, Samuel Frier b Sept 7, 1847, Joseph b May 18, 1849, m Eliza Bean, Moses and Ann (twins) b June 23, 1851, Rachel b. July 4, 1852, m William A. McMaster, Hyrum b Feb 22, 1854, m Susan Garret, Jacob b March 27, 1856, m Kate Hampton Mary Ann b Jan 19, 1860, Margaret Roseline b Jan 16, 1862, m. William Woodard. Family home, Salt Lake City Missionary to England. Missionary to England 1865, first councilor to Bishop Lytle of 11th ward, Salt Lake City, 1852, patriarch. Information on the above Mormon Shooter and Clubber, was obtained from the following: Pioneers and Prominent Men of Utah, Lee and Shirts.